This paper finds a close tie between loess magnetic susceptibility and wind strength in the Ili Basin, eastern Central Asia, and identifies three distinct aerodynamic environments with end-member modeling analysis of grain size. The Siberian High is the dominant influence on wind dynamics, resulting in loess deposition, and acts as a teleconnection between the climatic systems of the North Atlantic and East Asia in the high northern latitudes, but not for the mid-latitude westerlies. Significant climate changes and biotic turnovers occurred across the Cretaceous–Paleogene boundary (KTB) interval. It is of great significance to carry out research on palaeoclimate evolution across the KTB in terrestrial basins because we lack many KTB records in this part of the world. Here we provide a new terrestrial record from the Nanxiong Basin (SE China) and compare it with marine records to provide reliable terrestrial records for future investigation of ocean–land climate interactions. Here we present a high-resolution timescale synchronization of continental and marine deposits for one of the most pronounced global warming events, the Paleocene–Eocene Thermal Maximum, which occurred 56 million years ago. New high-resolution age models for the Bighorn Basin Coring Project (BBCP) drill cores help to improve age models for climate records from deep-sea drill cores and for the first time point to a concurrent major change in marine and terrestrial biota 54.25 million years ago. Here we present a multi-proxy study of flowstones in fractures of crystalline rocks with the aim of assessing the palaeoclimate significance of this new type of speleothem archive. Our results indicate a high degree of spatial heterogeneity, whereby changes in speleothem mineralogy and carbon isotope composition are likely governed by aquifer-internal processes. In contrast, the oxygen isotope composition reflects first-order climate variability. 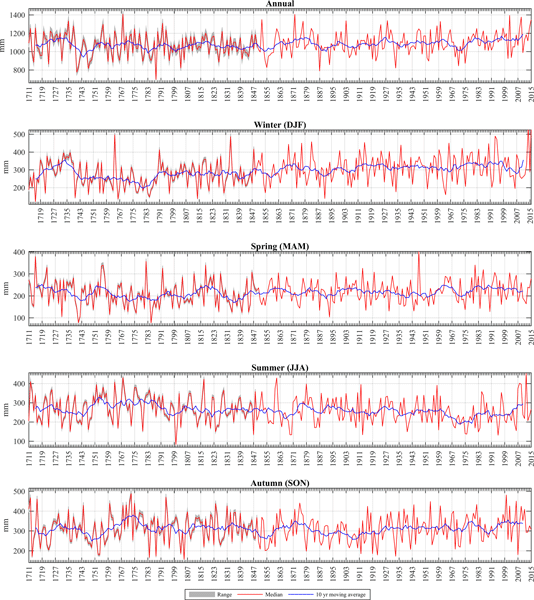 The chironomid-inferred temperature record from Gonghai Lake exhibits a stepwise decreasing trend since 4 ka. A cold event in the Era of Disunity, the Sui-Tang Warm Period, the Medieval Warm Period and the Little Ice Age can all be recognized in our record, as well as in many other temperature reconstructions in China. Local wars in Shanxi Province, documented in the historical literature during the past 2700 years, are statistically significantly correlated with changes in temperature. The buildup and melting of ice during the early glaciations in the Northern Hemisphere, around 2.5 million years ago, were far shorter in duration than during the last million years. Based on molecular compounds and microfossils from sediments dating back to the early glaciations we show that the temperature on land and in the sea changed simultaneously and was a major factor in the ice buildup in the Northern Hemisphere. These data provide key insights into the dynamics of early glaciations.